Carol Oelker, who tackled the interior design with the help of Cindy Collins of Cucina Kitchens and Baths, had her own set of challenges. She wanted “to choose interior materials to complement the clean, modern lines of the house and not detract from the phenomenal oceanfront view,” she said. 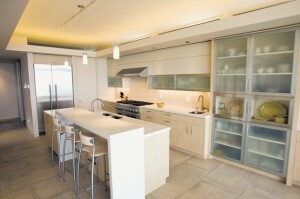 Her solution was a palette of light neutrals to play up the brightness and openness of the space. To keep rooms from feeling “chopped up,” she chose the same color for all walls: Benjamin Moore’s Edgecomb Grey, a soft, earthy hue. Flooring throughout the house is covered in large, 24-by-48-inch porcelain tile in a color inspired by beach sand. Neutral does not translate to boring, however. The Oelkers introduced hints of opulence, such as the living room fireplace, which is sheathed in a mosaic of Calcatta marble in shades of tan, gray and warm white from Matt Clark Tile & Stone. The marble pieces were artfully laid out by tile setter Mike Burke to best highlight the dramatic patterns in the stone.